The great thing about Japanese TV is that when a Hollywood sequel is released in theaters, every previous movie is shown on TV. In the last few weeks, we got to enjoy all three of the previous Terminator movies. So by the time I got to watch Terminator Salvation, I was able to get a nice review of the entire series. In previous incarnations, cybernetic assassins had come back to kill the mother of the future leader of the resistance, the leader himself, and then when those attempts failed, the officers of the resistance. In T-4, the conceit of robots being sent from the future is retired, and the future is finally the main backdrop for the movie. I’m a sucker for cool futuristic machines, and for post-apocalyptic narratives. Those things alone were able to erase many plot holes. I chose to ignore how people were able to survive nuclear blasts (two are in the movie). I also turned a blind eye to how easily humans were rescued from the epicenter of the robot civilization. It was conspicuously undefended. I also chose not to be troubled by the fact that the “capital” of the machine world was San Francisco. It somewhat makes sense since Silicon Valley is nearby. But it seems like a sneaky subtext of portraying leftist SF as the ground zero of technological evil. It’s straight out of some right-wing paranoid fantasy. Because the story is set in the future, many characters no longer make an appearance. Most conspicuously, Arnold Schwarzenegger is absent except through a computer rendered version. But I guess he figured he’s overseeing enough real life carnage and havoc in California’s economy. The psychiatrist who has appeared in every previous movie is gone. Sarah Connor only appears via voice recordings, consulted by her son as a kind of tabletop prophecy or oracle. The role of John Connor’s father is reprised, and it was cool to see an actor picked who looked like the original actor. 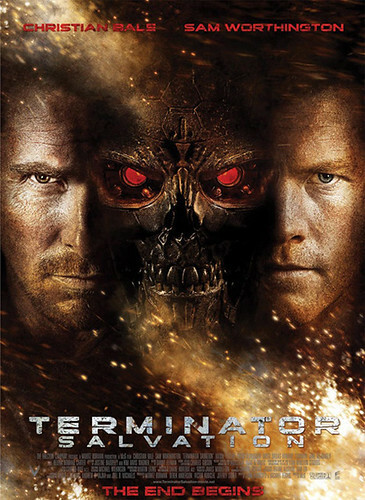 Even though John Connor, as the leader of the human resistance, should be the most important character of the story, he is presented as more of a McGuffin to the compelling Marcus Wright character, played by Sam Worthington. This would make it the second movie in a row that Christian Bale has been overshadowed by a supporting Australian actor (the first one being his Batman taking a back seat to Heath Ledger’s Joker). When watching a movie like T-4, my only requirement is that I be entertained, that the flaws of the movie not be distracting. But this time, the slick designs of the imagined future distracted me from improbable plot points. And that’s good enough for me. I haven’t seen it yet but I hope to soon. I’ve always been so impressed by the art work in the Terminator movies. I once heard that the ILM guys who worked on the first film had the same drawing instructor I had when I was a fine art student, though they were in a different program (animation) and a couple of years ahead of me. He was a pretty awesome teacher. what a cool connection. but between sleek tech gizmos and your nature art, i’ll take the nature every time. Terminator is not only a sci-fi. I think Terminator serie is a anticipation concept. One of these days. Before the end of this century .Some armys of the world will operate real war cyborgs and robots. Politicaly correct because no more human lost …. For me The Terminator movie has been a revelation !!! 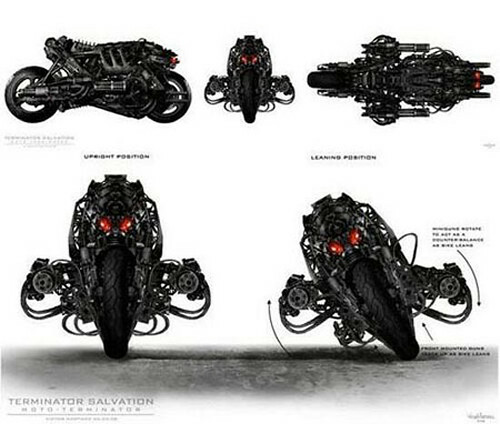 Me i very liked the Terminator Salvation movie . Non stop Action !!! Yes the story is not very elaborate but the action scenes are perfect for me !! If you like special effects this movie is for you !! !